Founded in 1866, the Association’s first president, Rachel Howland, was a prominent New Bedford Quaker preacher, activist and philanthropist. One of her lasting legacies, the Association for the Relief of Aged Women, has operated continuously since then. Not alms alone, but a friend. Peace, love, and understanding were hallmarks of Rachel Howland (1816-1902). 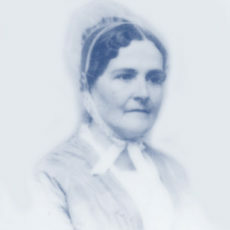 Rachel Collins Smith was born on May 6, 1816, in Burlington, New Jersey, into a prominent Quaker family that struggled financially for two generations with the early deaths of her father and grandfather. From 1840 to 1842, New Bedford’s Matthew Howland, co-owner of the whaling business George Howland & Sons, courted Rachel in Burlington with visits and letters that are now part of the Howland Family Papers in the New Bedford Whaling Museum Research Library. The responsible Matthew and the enlightened Rachel were married on September 8, 1842. The newlyweds settled in New Bedford, where Rachel continued her activity in the Society of Friends and began her work in peacemaking and compassionate philanthropy.